Ashton Terrill (6) celebrates after a Norse point during the game against Oakland. 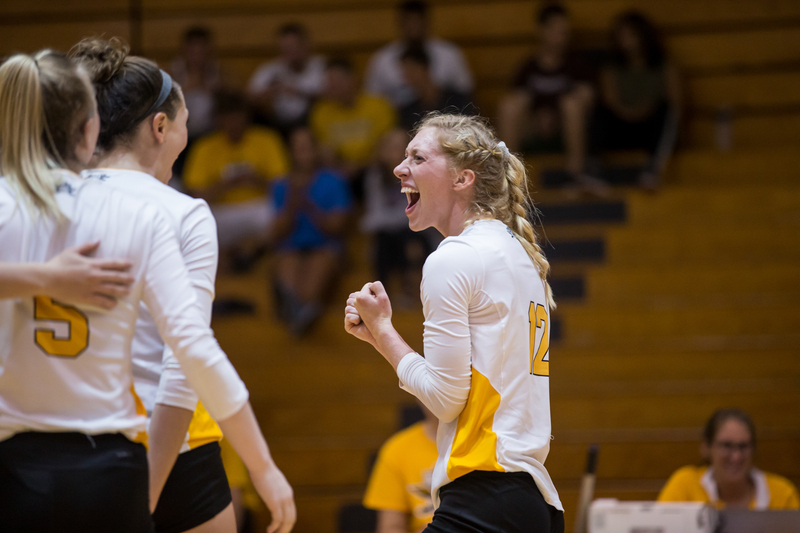 After recording their highest finish in conference play and tieing Cleveland State for second place, the Norse will enter the 2018 Horizon League Volleyball Tournament as the No. 3 seed and will begin play with a quarterfinal matchup against the No. 6 seed Wright State Raiders on Friday, Nov. 16. The Norse will be led by senior standout Haley Libs, who was recently named to her fourth consecutive All-Horizon League First Team and Horizon League All-Academic Team honors. 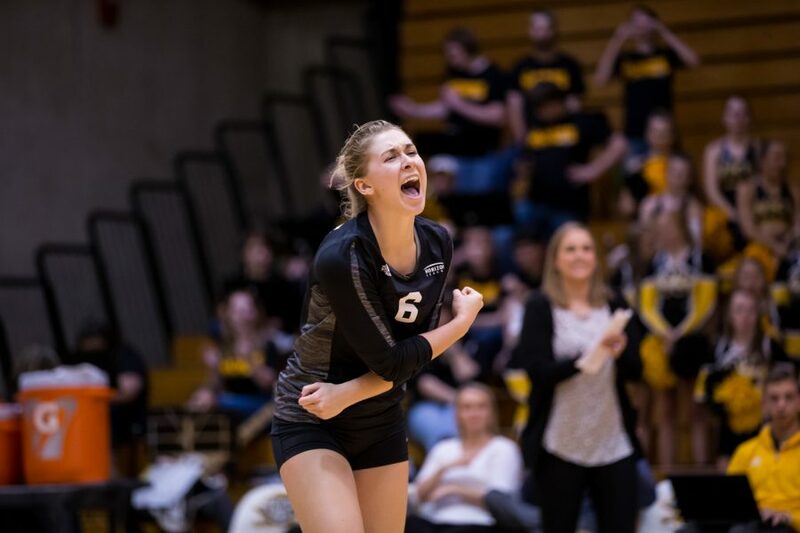 The Floyds Knob, Indiana native became the Norse’s first Division I player to record 1,000 kills and 1,000 digs in a career and made the cut in the second round of the 2018 Senior CLASS Award and was named a top-10 finalist. The four-time Horizon League Offensive Player of the Week finished the regular season with 22 double-doubles and averaged 3.94 kills and 3.97 digs per match, making her the only player ranked in the Horizon League’s top-10 statistical leaders. In addition to Libs earning All-Horizon League First Team honors this postseason, sophomore libero Ashton Terrill was also selected to the All-Horizon League First Team, while Bailey Western was Honorable-Team mention and Anna Brinkmann and Miranda Wucherer were selected to the All-Freshman Team. Terrill, who helped the Norse lead the nation in digs (19.93) per set, led the conference and ranked 14th nationally with 5.50 digs per set. 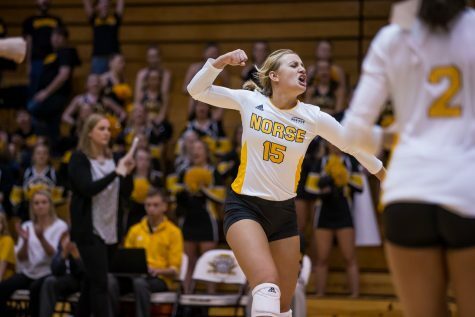 She also broke the Norse’s Division I single-season digs record with 589. Western averaged 2.19 kills per set and led the team with 12 solo blocks. Brinkmann was the Norse’s top passer in conference play with a .978 reception and ranked second on the team with 2.40 kills in league play, while Wucherer recorded 13 double-doubles and averaged 1.24 kills, 2.57 digs and 6.34 assists per set. Haley Libs (4) jumps to hit a ball during the game against Oakland. Libs had 14 kills during the game. The Raiders earned their way into the tournament after knocking off Cleveland State and Youngstown State last weekend, to finish the season 7-9 in conference play, thus, leapfrogging Oakland in the standings. This will mark the first time in over a decade that the Raiders have made the postseason and their 15-13 record is the best .500 or better since 2003, to go along with their most conference wins since 2008. The Raiders will be led by All-Horizon League First Team honoree Teddie Sauer, Honorable-Mention Team mention Celia Powers and All-Freshman Team honoree Jenna Story. Sauer finished the season with 257 kills and 93 digs, while Powers led the Raiders in kills with 292 and tied for second in blocks (96) and third in digs (236). Story averaged 4.93 digs per set, while tallying 537 total digs. She was twice named conference defensive player of the week. With a win over the Raiders, the Norse will advance to play the No. 2 seed Cleveland State Vikings, who edged the Norse in the tie-breaker to receive a bye into the semifinals and will look to make it to the NCAA Tournament for the fourth consecutive time. This will be the ninth time under head coach Chuck Voss that the Vikings will enter the tournament as a top-two seed and hold an overall record of 20-13 in Horizon League Tournament action. The Vikings will be led by middle hitter and All-Horizon League First Team honoree Trinniti Hall, Honorable-Team mentions Emily DeGeorge, Hannah Greene, Rachel Stover and All-Freshman Team honoree Christina Grecol. Hall finished the regular season with 319 kills and a hitting percentage of .273, while tallying 124 total blocks. DeGeorge started every match for the Vikings and tallied 419 digs and 246 kills this season. Greene ranked second nationally with 170 total blocks and added 181 kills, while averaging 1.63 kills per set. Stover recorded 211 total kills and posted 117 total blocks, while Grecol led the Viking offense with 1,062 assists and ranked second amongst the leagues players with 9.93 assists per set. Laura Crawford (12) cheers after a Norse point. The Phoenix (13-3) won their first-ever regular season championship and earned the top-seed in this year’s tournament, as well as the right to host. With the bye into the semifinals, the Phoenix will face the lowest remaining seed from the quarterfinals on Saturday, Nov. 17. The Phoenix had an exceptional season under first year head coach Abbey Sutherland, as she led the program to their most league wins in a single schedule and set the team’s longest winning streak in Phoenix volleyball history. As a result of their historic run, Sutherland garnerd Horizon League Head Coach of the Year honors, while Taylor Wolf was named Player of the Year and Offensive Player of the Year, senior Vanessa Buman received Defensive Player of the Year honors, and junior Maddie Yoss was selected as setter of the year. Alexandra Zakutney also earned All-Freshman Team honors. Wolf led the Phoenix with 461 kills and recorded an impressive 4.48 per set. 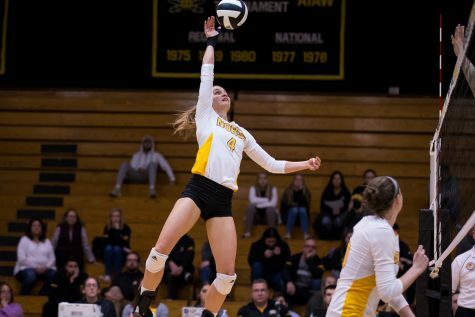 The Waconia, Minnesota native ranked within the top-three on her team in digs, assists and blocks, while ranking 14th nationally in points and kills per set. Buman collected a career-high 5.35 digs per set overall and 5.82 during conference play. Yoss led the Horizon League in assists at 10.82 per set and ranked within the top-five players on her team in kills(112), digs (254), blocks(51) and aces(25). Zakutney had a phenomenal freshman campaign while racking up 243 kills and averaging 2.56 kills per set. She also collected six solo blocks out of her 34 total. The Flames finished their regular season 17-12 overall and 10-6 in Horizon League action to earn the No. 4 seed in the tournament. Their 10 conference wins are the most since 2012 and they will be facing the Milwaukee Panthers in Friday’s second quarterfinal matchup. The Flames will look to Horizon League Freshman of the Year, Kiera James and All-Horizon League First Team honoree, Paola Santiago to lead the offensive attack against the Panthers. James finished the regular season with 325 kills, while averaging 3.32 kills per set. The Downers Grove, Illinois native was also selected to the All-Horizon League First Team and All-Freshman Team. Like James, Santiago was selected to the All-Freshman Team and averaged 2.81 kills per set, while tallying 10 double-doubles this season. The Flames led the conference with 14.35 kills per set and ranked second in hitting percentage at .214. Maddy Weber (15) celebrates after a Norse point during the game against Oakland. The Panthers enter this year’s tournament as the No. 5 seed after finishing the season 8-21 overall and a conference record of 7-9. Since joining the Horizon League, the Panthers have won the tournament eight times, four of which have come from current head coach Susie Johnson, who owns a 12-5 conference tournament record. The Panthers will be led by All-Horizon League First Team honoree Carmen Heilemann and freshman sensation Jess Grabowski. Heinemann made big strides her sophomore season with 213 kills while averaging 2.96 kills per set. The Senden, Germany native also tallied double digit kills 10 times this season. Grabowski, finished the season with an will impressive 546 total digs (freshman Panther record), while averaging 4.92 digs per set. With a victory over the Flames on Friday afternoon, the Panthers will notch their 500th total win, to go along with their 13 conference titles and 10 NCAA tournament appearances in their 29th season in Division I action. All matches will be broadcasted on ESPN+.